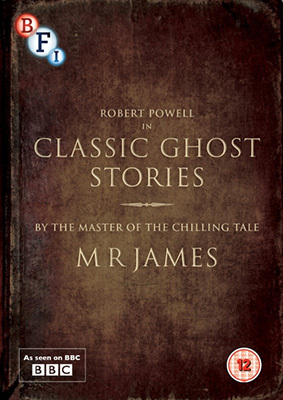 From the cosy confines of his study, a learned professor (award-winning actor Robert Powell – Jesus of Nazareth, Mahler, The Detectives) tells five terrifying tales by master storywriter master M R James. Inspired by M R James' legendary readings of his own words, these vintage ghost stories were originally broadcast by the BBC during Christmas 1986 and have been unavailable on DVD until now; Classic Ghost Stories by M R James is released by the BFI on 28th October 2013 as part of GOTHIC: The Dark Heart of Film. In The Mezzotint a haunted picture slowly reveals the horrors of the past, whilst The Ash-Tree tells of the execution of a witch and the dreadful curse she places on the Fell family. Wailing Well involves a troop of scouts who find that curiosity can be fatal, and Oh, Whistle, and I’ll Come to You, My Lad concerns itself with an academic who gets more than he bargained for after he discovers an enchanted whistle. Finally, in The Rose Garden, disturbing visions upset Mrs Anstruther’s gardening plans. Long unseen and much sought after, these celebrated readings are accompanied by an illustrated booklet and three episodes from the rare BBC series Spine Chillers, in which the acclaimed actor Michael Bryant (A Ghost Story for Christmas: The Treasure of Abbot Thomas) plays the M R James-like storyteller. Classic Ghost Stories is also being made available as part of the BFI's expanded Ghost Stories for Christmas box set, also released on 28 October. This 6-DVD collection contains over 13 hours' worth of chilling content, including all 12 episodes of the BBC's celebrated A Ghost Story for Christmas series, three instalments of Ghost Stories for Christmas with Christopher Lee from 2000, and a 48-page booklet with new essays and complete credits. Classic Ghost Stories by M R James will be released by the BFI on 28th October 2013 at the RRP of £19.99.